Normal matter, or the matter we and everything around us is prepared of, contains mainly of empty space. Even a rock is commonly blank space. This is for the reason that matter is made of atoms. An atom is a cloud of electrons revolving around a nucleus composed of protons and neutrons. The nucleus comprises of more than 99.9 percent of the mass of an atom, however it has a diameter of only 1/100,000 that of the electron cloud. The electrons cover little space, but the shape of their course describes the size of the atom, which is hence 99.9999999999999% empty space! What we observe as painfully solid when we smash against a rock is really a hurly-burly of electrons moving over empty space so fast that we can't see or feel the emptiness. What would matter appear like if it weren't vacant, if we can crush the electron cloud down to the size of the nucleus? Assume we could produce a force tough enough to crush all the emptiness out of a rock approximately the size of a football ground. The rock would be pressed down to the dimension of a grain of sand and would still weigh up 4 million tons! Such great forces come about in nature when the crucial part of a gigantic star collapses to form a neutron star. The atoms are crushed entirely, and the electrons are blocked inside the protons to form a star composed nearly completely of neutrons. The consequence is a tiny star that is like a huge nucleus and has no empty space. 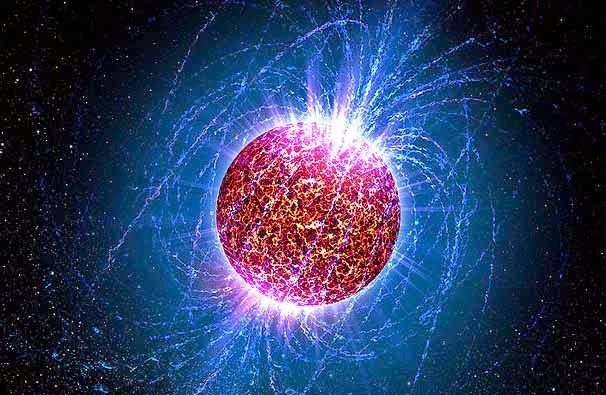 Neutron stars are bizarre and interesting objects. They signify an extreme state of matter that physicists are keen to know more about. However, even if you could visit one, you would be sensible to turn down the proposal.